Prospective clients are always looking for exceptional quality. It is an expectation that comes along with Margate, Ventnor, Brigantine, Ocean City and Longport beach community living. This is a special home, a special project that requires particular attention to design, detail and comfort. This is afterall a relaxing and carefree atmosphere. A place to escape for a few days. A place to bring your family and friends for a memorable experience in the sun, sand and surf. As you build your new project it should be just as relaxing. You should have complete confidence that you will have your custom project completed as designed, stand alone quality and completed on time for you and your family to enjoy. D.F. Poley recognizes all your needs and concerns and delivers. As you roam through our website please take note of our attention to detail and the comments from our clients and peers. 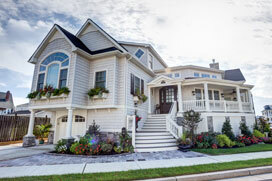 Producing exceptional homes on Absecon Island. I have hired about a dozen general contractors over the last twenty years, and D.F. Poley stands with the best of them. Mr. Poley took charge of the project from the very first (I live 150 miles away) and earned my total confidence. He followed through on every detail and made helpful suggestions along the way. I made periodic inspections and can attest to the high quality of his work. A licensed architect also made periodic and final inspections and endorsed my judgment that Dan Poley’s concept of the job, workmanship and final result were nothing short of excellent. “Our project with D.F. Poley Construction was a very challenging, detail oriented job. It involved the restoration of a unique 98 year old Victorian home. We are more then pleased with the results! Dan’s craftsmanship and attention to detail in his work is outstanding. He is a problem solver, and positive in his approach to handling all kinds of issues. His team is top notch. My wife and I cannot speak highly enough of D.F. Poley Construction. Dan Poley was our general contractor for the complete remodel of our beach house, which was built in 1922. Dan is as honest as the day is long and always comes up with a solution to the unexpected surprises involved in totally gutting and rebuilding a house. The people he hires display those same traits. We live several states away but they kept us updated regularly of the progress by emailing pictures and telephone calls. Two things separate D.F. Poley from other contractors: 1) dedication to doing the job perfectly; and 2) the confidence they inspire. At all times we felt that we were in great hands. Our house looks fantastic, was re-built to be energy efficient and is rock solid. We love it! We can’t imagine any other contractor could have done the job even half as well. Choosing a contractor is difficult but with D.F. Poly the decision is easy. From a lawyer’s point of view representing the homeowner on two of your projects, I was and remain greatly impressed by your professionalism and integrity — and the beautiful results. "As a Realtor, my clients are constantly seeking recommendations for the best contractor / builder to modify their home or create their perfect new dream home. Without hesitation and from personal experience I recommend Dan Poley of D.F. Poley, Construction, Inc. Homes are my business and I need to know who can provide the best service to me and to my clients. I am very careful before I hire someone for myself and before I promote a tradesman to a client. I need to have the confidence that this person will not only deliver what is promised, but will totally satisfy and please them completely. D. F. Poley Construction, Inc. provides quality work with a creative flair. While I had ideas of what I wanted, they were able to assist me through the entire process with suggestions and alternatives that helped me achieve my ultimate goal. The work was done in a timely manner and my home was not a war zone. They knew I had a budget and once we had a budget set it was adhered to strictly. There were no surprises at the end of the job. Anyone who has done renovations before should really appreciate that. As a Realtor my home serves as a showcase to other potential homebuyers as they can see what can be made possible with a home with potential and a talented contractor like Dan Poley. I am happy to say that many of my clients have already used the services of D.F. Poley Construction, Inc. and like me they are thrilled with the results." "The name D.F Poley is all we have in the end. Integrity is everything. We work extremely hard to maintain that on a daily basis. We offer a service not just a product."